A Save the Children charity worker in Burma was dismissed on suspicion of trafficking boys under 18 years old to serve in a rebel army, it has emerged. US diplomatic cables released by the Wikileaks website said his activities came to light last year when one of the victims escaped. At least 16 other youths were reported to have been conscripted into the United Wa State Army, which operates near the Thai and Chinese borders. The man was arrested by Burmese police. "It is our understanding that the individual was taken into custody by the Myanmar [Burmese] police," Save the Children spokesman Steve Sidebottom told the BBC. "The matter is now in the hands of the authorities. The Save the Children employee was stationed in Shan state in the far east of Burma. He is accused of trafficking nine young males - two of whom were under 18 - for service in the powerful UWSA, which is alleged to finance its operations through the drug trade. The charity told the BBC that the employee had encountered the young men through "local contacts". Save the Children told US diplomats that some of the other conscripts were thought to have escaped into China, and that others had eventually made their way home. In diplomatic cables released by the Wikileaks website, the charity said the local representative appeared to have been working for "political reasons rather than for financial gain". It said both he and the victims are members of the Palaung ethnic group, some of whom are allied with the Wa. "The victim who escaped reported that at least 10 other young people from Nam Kham, and six from neighbouring Nam Sam, were serving with him in the UWSA," the cable said. Save the Children said the staff member was suspended as soon as the allegations came to light and was later dismissed. The charity said it had been providing assistance to all the families involved. 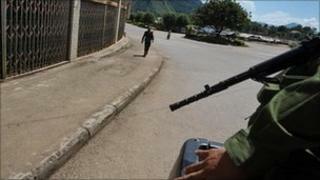 The legal age for army recruitment in Burma is 18, but analysts say the problem of trafficking is thought to be endemic.